My first idea was to propose a clock where each minute would be unique based on how a subject would count 60 seconds. After reflection, I thought about a first proposition where the unit would not be related to the counting subject, but rather to the second itself. I decided to work on a program that would propose a singularity of each second. Each interval between two seconds would therefore be different: randomly moving between from 5 milliseconds to 60 full seconds. The result is a clock where the second-hand accelerates and decelerates. The clock doesn't give the precise time, but just an approximate idea. Given the changes in process as described above, I have also decided to change the name of the project to The Clock. 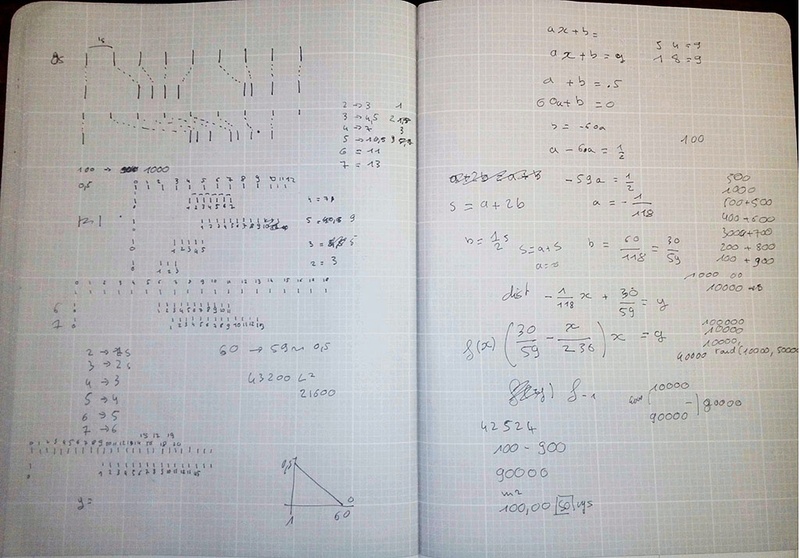 Fayçal Baghriche, The Clock, notebook page: Research of Probabilities. Courtesy of the artist.